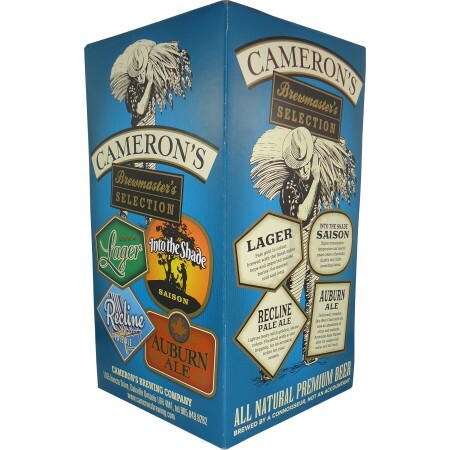 OAKVILLE, ON – Cameron’s Brewing has announced the release of a new edition of the Cameron’s Brewmaster’s Selection sampler pack, featuring two flagship brands and two limited edition offerings. The seasonal four pack includes 341 ml bottles of the brewery’s year-round Cameron’s Lager and Auburn Ale; recent Ontario Brewing Awards silver medal winner Into the Shade Saison; and the brand new Recline Pale Ale. Into the Shade Saison has fermented at a higher temperature than your average beer, and is combined with special Saison yeast, and a polite amount of mild lemon and light fruity hops, to create a flavourful, slightly tart, thirst-quenching Saison. Traditionally, Saisons were made for farm workers to keep hydrated in the summer, so Cameron’s invites you to slip on into the shade. We are also delighted to introduce Recline Pale Ale, a subtle session beer with a golden, straw colour, and a lighter body than your regular pale ale. This thirst-quenching, low alcohol at 4.6%, easy to drink beer has been finished with a deep tropical fruit and citrusy-noted hop addition for an aromatic tickle for your senses. So pull up a chair and Recline! The Cameron’s Brewmaster’s Selection four pack is available now at select LCBO locations and the Cameron’s retail store for $10.50 per pack.